In the world of Apple Macintosh desktop computers there two different choices. Either you get an all-in-one desktop like Apple's iMac series of PCs or you go for a component system, in which case you either go for an Apple Mac mini or an Apple Mac Pro. Both machines are component systems in that regardless of the configuration, you are only purchasing the CPU without a monitor, keyboard, mouse or any type of media storage device or reader save for whatever comes with the unit configuration you've purchased from Apple. This enables a more customized user experience, but if you want to use Apple's peripherals to interact with your Mac PC, you will have to purchase the components separately and that will add to the overall cost of creating a useable system. This should be considered before making a purchase. An iMac may be a better match, but for those who are not power users or those that need the might of a Mac Pro, which costs well into the thousands of dollars, then the component setup is the way to go. Yet if you are not buying a Mac Pro then the alternative is the eponymous Apple Mac mini. People have found various uses for these machines and the Mac mini remains the cheapest way to enter the worlds of OSX with the baseline model starting at approximately $599. Available in several configurations directly from Apple or at a local Apple Store as well as authorized resellers, the entry level Mac mini features a 2.5GHz dual core Intel Core I5 processor with 3MB L3 cache (Turbo Boost up to 3.1 GHz). The Mac mini also can be ordered with an Intel Core I7 processor too. There is 4GB of 1600MHz DDR3 SDRAM included that is expandable up to 16GB . A 500 GB 5400-rpm Hard Drive is pre-installed, but users can swap out the hard drive for Apples's Fusion Drive, which combines a SSD with a traditional Hard Drive that is supposed to boost the speed of boot times and data recovery. The server Mac mini option has two 1 terabyte hard drives inside. There is also an Intel HD Graphics 4000 card with HDMI and Thunderbolt output options. Within the box comes a small HDMI to DVI adapter included. The Thunderbolt port supports high-speed I/O and mini Display Port devices with data, including picture and sound traveling from the Mac mini to the user's chosen display. The Thunderbolt port, HDMI port and power adapter are found on the back on the Mac mini with the power supply built into the unit itself so there is no unwieldy power brick to deal with when setting up the Mac Mini. Also found in the back of the unit are an SDXC card slot, FireWire 800 port and four USB 3.0 ports. A 10/100/100BASE-T Ethernet port is also found at the rear of the unit as well as 802.11n WI-FI and Bluetooth 4.0 is supported. Combined optical digital audio output/headphone out as well as combined optical digital audio input/audio line are found behind the Mac mini too. There is also an internal built-in speaker as well as vent for cooling the computer that are at the bottom of the rear grid of ports. You can have the sound come through personal speakers plugged into the Mac mini directly or routed through to the display via Thunderbolt or HDMI connection. Apple's OSX.9.4 Mavericks comes preinstalled with this model with a free upgrade coming from Apple later this year to OSX.10.10 Yosemite in 2014. Compatible with iCloud and the iOS counterparts, Apple has included at no extra charge both the iLife and iWork suites of programs with iPhoto, iMovie, and GarageBand as well as Pages, Numbers and Keynote so one can immediate use the Mac mini out of the box in productive ways. Bluetooth keyboard pairs easily with the Mac mini and is small yet comfortable to use with it's responsive chicklet styled keyboard. There is no optical drive included with the Mac mini, but Apple's USB SuperDrive connects effortlessly with the Mac mini and provides optical disc support within the traditional silver aluminum body that customers of Apple products have come to expect and the USB SuperDrive, Magic Mouse and Wireless Keyboard all carry the same visual style aesthetic and look beautiful together as well as work harmoniously with the Mac mini too. 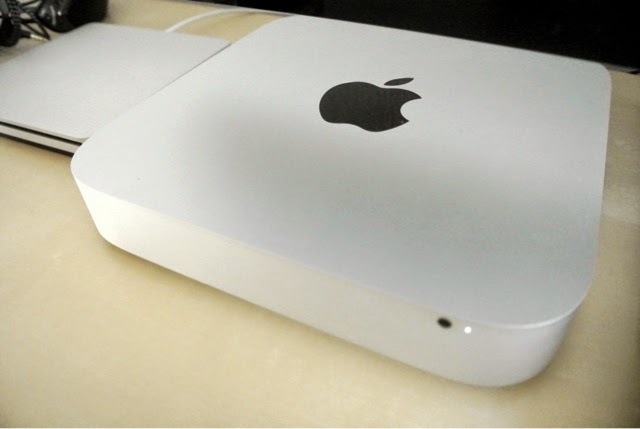 The Mac mini has the classic silver aluminum body with rounded edges and in keeping with Apple's minimalist style, features only an IR sensor and an LED indicator light in front, the Apple logo in black branded on top and the removable black twist off Mac mini branded lid at the bottom that allows easy access to the internal parts of the computer. Now while you can use this Mac as a media center PC by plugging it directly into the HDMI port of your HDTV, you can also use it with Apple's 27 inch Thunderbolt Display, which like all the peripherals in this review is sold separately. Combining the Thunderbolt Display with any Mac PC can create an awesome and powerful if not visually impressive computer setup. The Thunderbolt Display is the successor to the Apple Cinema Display and can be used as a primary monitor for a Mac mini or Mac Pro, a second screen experience with an iMac though it should be noted that the Thunderbolt Display while appearing externally to be very similar to an iMac all-in-one, is actually a bit taller and it must be emphasized that the Thunderbolt Display is not a computer like an iMac all-in-one, it is a component for a Macintosh computer system. It is also a docking station intended for Apple's MacBook Air and Pro laptops that comes a MagSafe Connector and an adapter for charging your MacBook while also using it depending on the compatible accessories used as an extension or second or expanded screen experience or as a dock even with the MacBook closed provided once again that the user already has the necessary add ons sold separately paired or connected to the unit. The cable that comes connected the Thunderbolt Display also acts as a Thunderbolt cable connector, which when plugged into the Mac mini yields a resolution of up to 2560 by 1440 pixels with a full 27 inch viewable screen size accented by a glossy black bezel with in the Apple logo branded in white at the bottom center of the screen. The display also auto adjusts to give the best picture that is easy on the eyes with an ambient light sensor. There is also a 720p FaceTime HD front facing camera on the top center of the display and a builtin mic too. The same aluminum body and silver coloring is used here along with a large black Apple logo branded in the back as well and the Thunderbolt Display can tilt or pivot up and down and has a hole at the neck of the stand, which comes out of the box pre-connected to the monitor for wire management. The bottom of the Thunderbolt Display has 2.1 down firing stereo speakers with a built in subwoofer. The power supply is also incorporated into the monitor itself. Besides the power input and the pre-connected MagSafe and Thunderbolt cable, there is a Kensington security lock loop, a Gigabit Ethernet port, a Thunderbolt port, a FireWire 800 port and three USB 2.0 ports that expands the options to one's Mac mini, Mac Pro, or MacBook Air and Pro too. You can also use the monitor to charge your iOS devices, including the iPad. 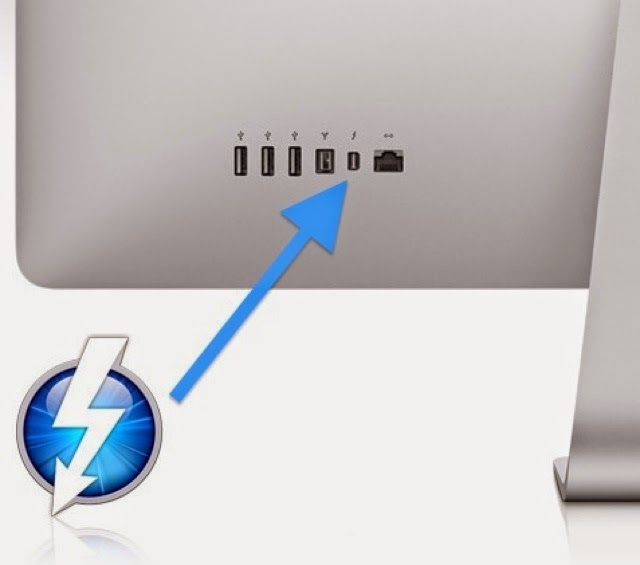 Once connected to the Mac mini, the Thunderbolt Displays powers on and off and falls under the general control of the Mac mini as one system. 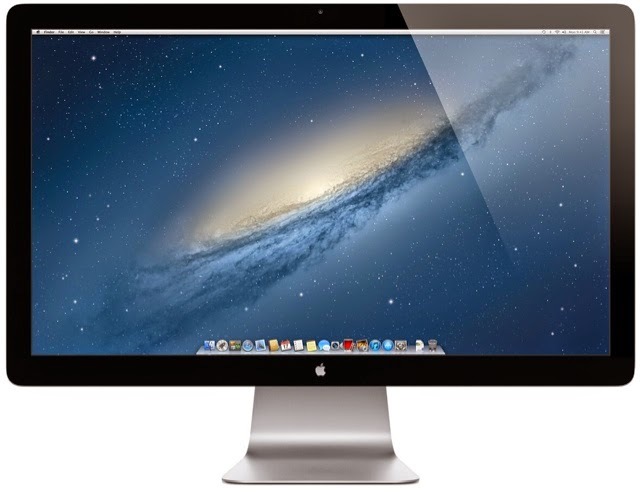 The Thunderbolt displays sells for approximately $1000 dollars or a bit less depending on where one purchases the monitor, which is why consumers out to buy a Mac desktop may want to go with an iMac instead, but if you are interested in a component Mac system or already own a Mac mini, Mac Pro. MacBook Air or MacBook Pro and want a fantastic Apple display, the 27 inch Apple Thunderbolt Display is well worth considering. Adult Swim's Tim & Eric Are Baaaaaaack! Please Examine For Yourself And Pass On. Rest In Peace Ms. Lauren Bacall. Who was your favorite Guardian? SYFY’S 2014 FALL PROGRAMMING SCHEDULE.